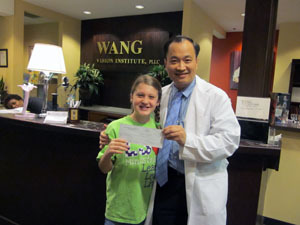 Abigail is 10 years old and attends Christ Presbyterian Academy. She loves singing, dancing, basketball, and Jesus. Abigail has a huge heart for orphans and God's word. One night, last April, Abigail woke in the middle of the night crying. My husband and I went into her room and asked what was the problem? She stated that, " all the orphans in the world do not have mothers to love on them and if they die they won't know Jesus." So we talked about how we could help orphans learn about Jesus. She said " how about we give each of them a Bible". Our Middle School (MS) principal is very mission minded. So, Abigail went to meet with her to decide what she could do to formalize the call the Lord has put on her heart. The MS principal encouraged Abigail to start a ministry and decide on a name for it. Abigail came up with L3 Ministries - Learn, Love, Live - Learn the Word, Love the Word, and Live the Word out in all aspects of life. Abigail and the MS principal brainstormed on a way to raise money to get Bibles. Abigail created a t-shirt and sold them at school. The Middle School students could wear jeans for a week if they wore their L3 shirts. Amazingly she raised over $1500 for the Lord and the purchase of Bibles. Next we had to figure out how to get the Bibles in their hands. In the meantime when went to China to adopt our 7 year old daughter. We wanted to take the Bibles with us but only could take 3 into the country. When we got back Abigail said we have got to find a way to get Bibles into the hands of the Chinese. This is when we heard about Wang's Institute and how they were sending Bibles to China. 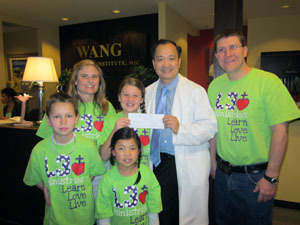 Wonderful we can donate the money to Wang's Institute. What a perfect fit. Abigail just wants everyone to know about Jesus and what to wonderful way to start with Bibles.